Robert Kirkman’s and Dave Alpert’s Skybound Entertainment has teamed up with Skydance Interactive to develop multiple “The Walking Dead” virtual reality (VR) games, both companies announced at the E3 Entertainment Expo in Los Angeles Wednesday. News about Skybound working on a “Walking Dead” VR title was first reported by Variety in April. Skybound is best known for being behind both the original “The Walking Dead” comic series as well as the show for AMC, and Murray said that the company had been looking to enter VR for some time. “We have been pretty patient,” he said, waiting for the medium to develop and the right opportunity to come along. “We’ve been approached by everyone under the sun” about turning “The Walking Dead” into a VR game, he said. Ultimately, his team decided to cooperate with Skydance Interactive because of the company’s vision for the title. “They had a very original take on it,” said Murray. “The Walking Dead was just the perfect IP,” agreed Skydance Interactive president Peter Akeman. Both companies kept mum on how the game is exactly going to look like, save for a few hints. The games will give fans a way to immerse themselves in the world of the show, but feature a new setting and new characters. And yes, there will be walkers, but zombie slaying will not be the key objective. 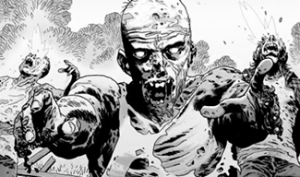 Murray said that the team at Skybound often likens zombies on the show to the weather — something that happens in the background, while the real focus is on the interaction between humans. Virtual reality would offer a perfect opportunity for fans to immerse themselves in these deeper story-lines, he said. There’s also no word yet on the platforms the games will launch on, but Akeman said that the goal was to bring it to all of the existing high-end systems, which presumably includes Oculus Rift, HTC Vive and Playstation VR. “We are very excited about deeply interactive VR,” he said. Akeman also shared that he is optimistic about the trajectory of VR, despite reports of lagging headset sales. “We saw a surge of strong commercial interest this year,” he said.“We are pretty encouraged by what we see happen right now.” Especially encouraging had been the success of Sony’s PlayStation VR, which recently surpassed one million headsets sold. “Sony’s platform has been a game changer,” said Akeman.